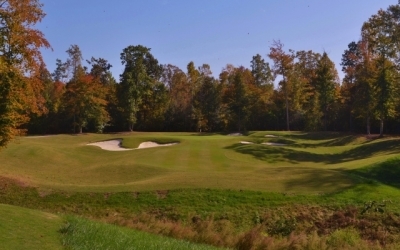 NEW KENT, VA -- Viniterra means “earth wines” or “land of grapes,” said Matt O’Grady, Head Golf Professional at The Golf Club at Viniterra, Virginia’s newest public golf offering on the historic peninsula (located between Richmond and Williamsburg) in the southeastern part of the state. There’s something about wine that just alludes to the bounty of the land – it has a quality all its own. 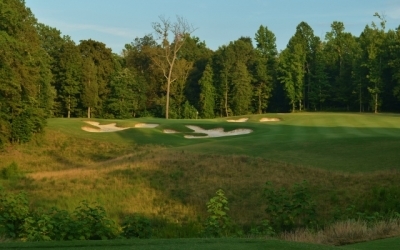 Viniterra’s golf club should probably be thought of in the same way, as the Rees Jones designed beauty is certainly destined to be included with the top tier of the Old Dominion’s finest golf experiences. The 3rd hole is the first of a terrific set of par threes at Viniterra. The fact that a portion of the golf course borders on vineyards only enhances the atmosphere. It’s quite a place – not bad for a club that’s only been around for a few years (it opened in late 2009). The course will eventually be bordered by an upscale housing community, but the lots have more than adequate setbacks to allow the golf to retain its secluded quality. History abounds in this part of Virginia, and Viniterra lies adjacent to the famous Rochambeau Highway (where Washington’s troops marched on the road to victory at Yorktown in October of 1781). The property is also close to several Civil War battlefields of McClellan’s peninsular campaign of 1862. The rugged nature of the topography and its large size (nearly 1200 acres) also adds distinction to Viniterra. Just driving the course in a golf cart is an outdoors experience in and of itself. The view from the tee of the par five 10th hole is vintage Viniterra. Jones had worked with Boddie-Noell before, on the Currituck Club in North Carolina’s Outer Banks. 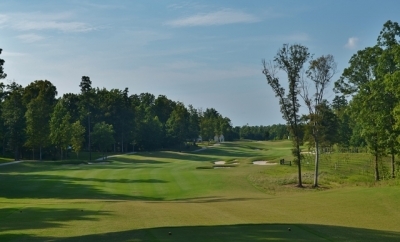 The Currituck Club enjoyed quite a lot of success over the years, so the company decided to combine with Jones once again, this time in eastern Virginia. Wingfield Properties purchased Viniterra Golf Club from Boddie-Noell in late 2012. A bunker guards the sharp dogleg left, par four 2nd hole. True. There are some real ups and downs at Viniterra, though it’s probably not quite as topsy-turvy as nearby Williamsburg. 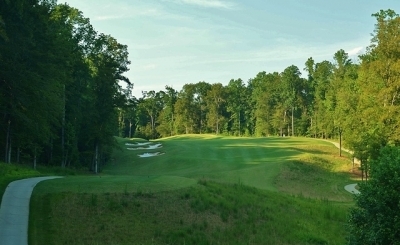 Jones built the Green Course at the Colonial Williamsburg’s Golden Horseshoe (and renovated his dad’s Gold Course right next door), and he said Viniterra was not quite as severe in the topographical sense. The par three 17th is rated the easiest hole on the course. We agree. Jones added mounding to the sides of the fairways on the Green Course to help keep tee shots in play, but didn’t have to use them at Viniterra. 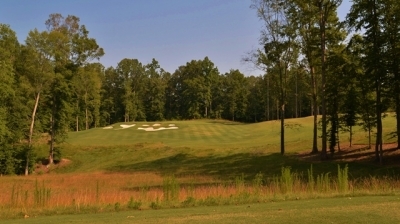 Viniterra offered more than enough land to build generous landing areas, and most of the holes are bordered by a rather dense wildlife-rich Virginia forest mix of hardwoods and pines. If the ball reaches the woods, it’s probably gone – but that shouldn’t happen too often. Though the layout is certainly wide, it’s also long – over 7700 yards from the professional tees. Now that’s a chunk of real estate. The par four 4th hole plays much longer than its 472-yards because it is uphill and often into the wind. Shorter-hitting players shouldn’t have a problem at Viniterra, largely because there aren’t any forced carries off the tee from the forward sets. Add the fact that most -- if not all -- the greens allow for a run-up shot, and you’ve got built-in forgiveness. There are several options off the tee and second shots on the par five 13th hole. As an example, my 8 year-old son was able to play the entire course -- and that doesn't happen too often because of forced carries. Similarly, Viniterra’s putting surfaces are sloped and challenging but not ridiculous or goofy. Like every good championship course should, there are pin positions that will force good players to be precise in order to make birdie – but also a healthy dose of gentler pin locations for everyday players. It’s up to the superintendent (Ryan Dwyer, who does a terrifc job, by the way) as to how tough the course will play on any given day. Better hope he’s in a good mood. The 7th hole is the shortest par three on the course, and could be its most memorable. Greenside bunkers are large at Viniterra, and can be deep, but there are also shaved roll-off areas that allow for creativity in playing short shots. For those of us who prefer to employ our putters as a wedge, it’s a good place to go. Wetlands also factor into Viniterra’s layout, though the only sizeable body of water to hit over is on the tee shot of the par four eighteenth hole. Jones said they were able to handle the environmental wetlands issues by building 13 bridges – some of which are quite lengthy. Again, driving the cart paths offers quite an adventure. One thing the course is not is walk-able. The distances between the holes and the bridges preclude walking, and it’s not an option should you inquire in the clubhouse. If walking were offered, it would probably take about seven hours to complete a round. Bunkers wait to swallow wayward tee shots on the par three 15th hole. We've played the course several times in different seasons, and the condition of the course was first-rate every time, though Viniterra still shows signs of being fairly young. O’Grady said some of the tall fescue areas have been cut down recently to increase playability which speeds up play and enhances safety. The trimming was particularly noticeable on the par five ninth, where a member of our party sliced one off the tee into a fescue area – but the ball was still find-able – and playable. The inviting green of the long par five 6th hole. 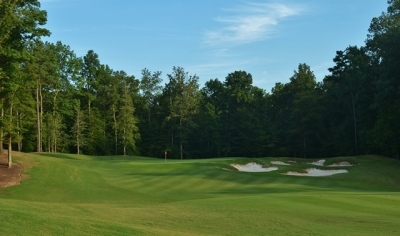 Viniterra’s hole highlights include the par three third hole, which can stretch out to 233-yards from the back tee box. The tee shot is over a natural area (though it won’t come into play unless you shank it), and the green is protected by bunkers in front (left and right) that guard the approach to a tiered green. Watch the back left pin position – if you’re not on the right level, it’s a tough task to two-putt. 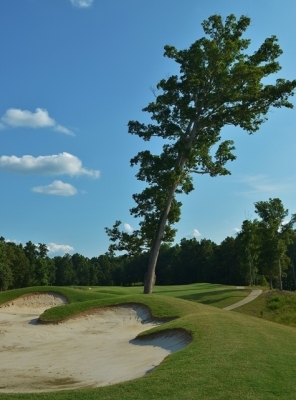 “But I personally think trees are very much a part of parkland golf -- especially in Virginia. And you do try to utilize the trees, particularly when they’re specimens,” Jones added. One of the most intimidating shots at Viniterra is off the tee of the par four 12th hole. The seventh hole is a short but memorable par three. 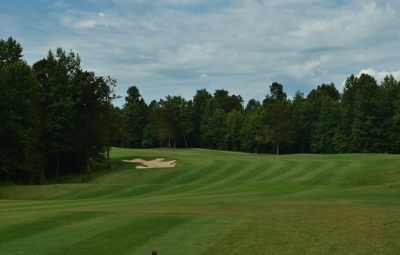 The most unique aspect of the hole is the tee shot, which can be launched from numerous locations. You could play this hole every day for a month and not be asked to hit the same shot twice. Nine is a terrific risk-reward par five, featuring a more-than-generous landing area for drives – but then the challenge begins. You can strategically lay-up to the right side of the second shot landing area, or go for the green – but if you take the latter option, you’ll need to execute, or pay the sandy price. The par five tenth is perhaps the “signature” hole at Viniterra, because of the vineyards to the right of the playing area (luckily they’re placed far enough to the right where players won’t be slicing into them). Get as close as you might on the second shot, but if you’re going to have a good birdie shot here, you’ll have to navigate the tricky green. Beautiful scenery on the long and strategic par five 9th hole. Both of the par threes on the back nine – numbers fifteen and seventeen – offer different angles of approach (similar to the seventh hole) depending on the tee boxes you’re playing. The fifteenth is a real tough shot from the back sets, as bunkers await anything short or offline. The round concludes with another Rees Jones classic finishing hole, with an intimidating tee shot over water and a second shot that will test your club selection. Here’s a good example of Viniterra’s short game challenges: I hit my approach long and it ended up in a shaved chipping area. Most players would probably flop or chip, but I was able to get it up-and-down by putting the ball, using the slope to carry it towards the hole. 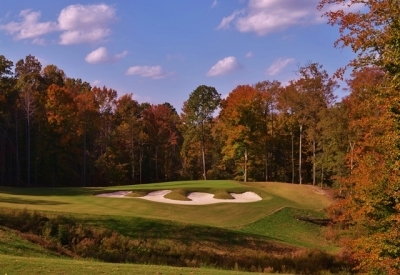 When you’re finished at Viniterra, you can’t help but feel that you’ve just experienced a real Virginia classic. 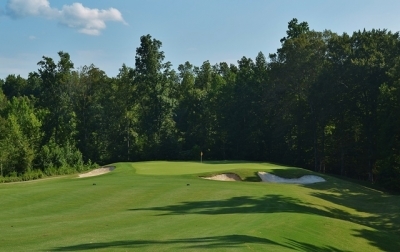 You can also package a visit to Viniterra with some of the other outstanding golf in the region, making Williamsburg one of the premier golf destinations on the east coast. Like a closing hole should, the par four 18th will leave an impression on you. And there’s more than enough non-golf related activities for your down-time. We always enjoy the historic sites in the area, while others prefer attractions such as Busch Gardens. Finally, no visit to Viniterra should end without a stopover to the winery next door, which is enjoying quite a boost in reputation for the quality of its wines. You’d expect nothing less from a club of this quality. All in all, Viniterra is a bountiful harvest, indeed. Consult the website for current rates and package offerings.